I couldn’t get over how amazing the castle looks, both inside and out. 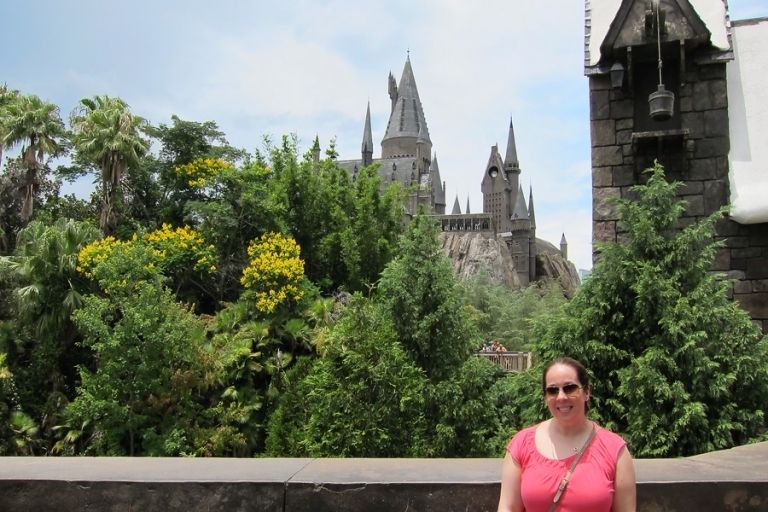 The Forbidden Journey ride (favorite!) 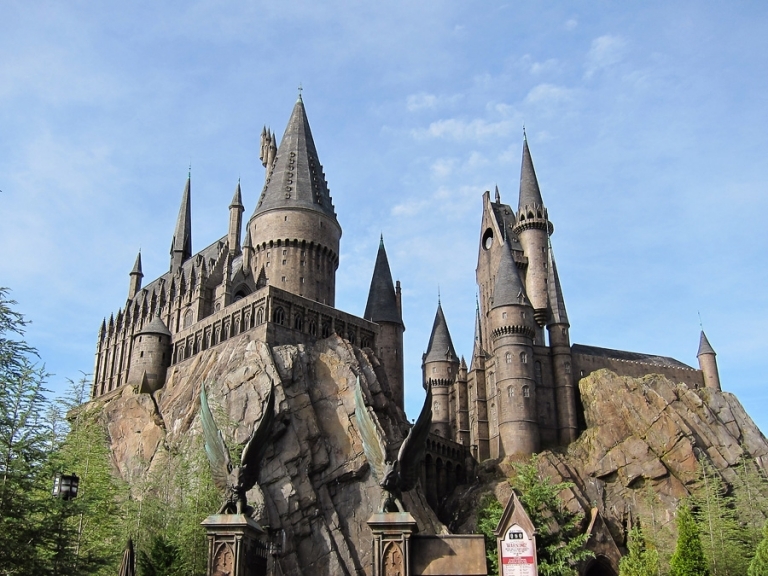 is tucked within the walls of Hogwarts, and while you’re waiting in line for the ride, you’re treated to a tour of the castle’s hallways and rooms. We also braved the Dragon Challenge coaster, a pretty thrilling steel inverted roller coaster. Butterbeer is one of the best things I’ve ever tasted. Ever. It was so fun to have lunch at The Three Broomsticks, and to enjoy a butterbeer with our food just like in the books/movies. People keep asking me what it tastes like, but I almost don’t want to spoil it! It’s really fun to try it for the first time without knowing what to expect. And anyway, it’s sort of indescribable. 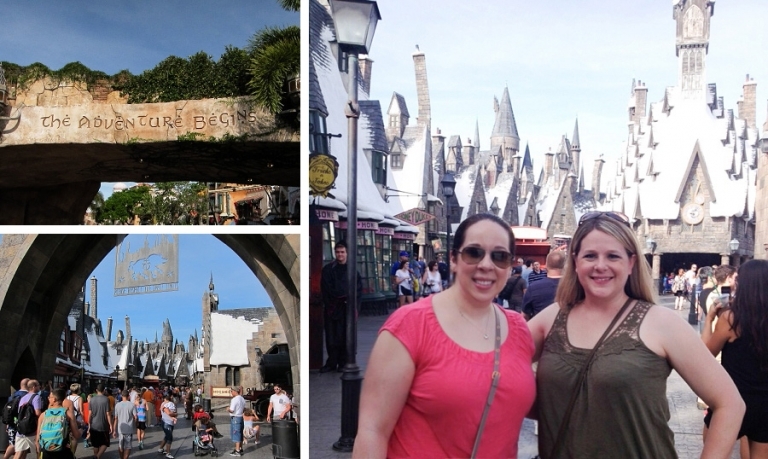 The little shops within Hogsmeade were (forgive the pun) magical. We really felt like we were in the story. I really want to get on the Hogwarts Express and go to Hogwarts! The castle at night is just breathtaking. Day Two, we headed over to the Universal Studios park, where we had a nice, sunny morning that turned into a rainy afternoon. Thankfully we were able to ride all of the attractions, and our timing allowed us to miss all the rain showers. Probably my favorite ride at Universal Studios side was the Rip Ride Rockit coaster. I absolutely LOVE thrill rides, especially huge roller coasters. The scarier the better. That lift is straight up! Really fun. We also had a great time becoming minions on the Despicable Me 3-D ride. As a Simpsons fans, we loved exploring Springfield and having a Krusty Burger AT Krusty Burger!